The original version of this article, by Nicholas Eberstadt, appeared in the Wilson Quarterly. In 2006, Japan reached a demographic and social turning point. According to Tokyo’s official statistics, deaths that year very slightly outnumbered births. Nothing like this had been recorded since 1945, the year of Japan’s catastrophic defeat in World War II. But 2006 was not a curious perturbation. Rather, it was the harbinger of a new national norm. Japan is now a “net mortality society.” Death rates today are routinely higher than birthrates, and the imbalance is growing. The nation is set to commence a prolonged period of depopulation. Within just a few decades, the number of people living in Japan will likely decline 20 percent. The Germans, who saw their numbers drop by an estimated 700,000 in just the years from 2002 to 2009, have a term for this new phenomenon: schrumpfende Gesellschaft, or “shrinking society.” Implicit in the phrase is the understanding that a progressive peacetime depopulation will entail much more than a lowered head count. It will inescapably mean a transformation of family life, social relationships, hopes and expectations – and much more. But Japan is on the cusp of an even more radical demographic makeover than the one now under way in Germany and other countries that are in a similar situation, including Italy, Hungary, and Croatia. (The United States is also aging, but its population is still growing.) Within barely a generation, demographic trends promise to turn Japan into a dramatically – in some ways almost unimaginably – different place from the country we know today. If we go by U.S. Census Bureau projections for Japan, for example, there will be so many people over 100 years of age in 2040, and so few babies, that there could almost be one centenarian on hand to welcome each Japanese newborn. Population decline and extreme population aging will profoundly alter the realm of the possible for Japan – and will have major reverberations for the nation’s social life, economic performance, and foreign relations. Gradually but relentlessly, Japan is evolving into a type of society whose contours and workings have only been contemplated in science fiction. It is not clear that Japan’s path will be a harbinger of what lies ahead in other aging societies. Over the past century, modernization has markedly increased the economic, educational, technological, and social similarities between Japan and other affluent countries. However, Japan has remained distinctive in important respects – and in the years ahead it may become increasingly unlike other rich countries, as population change accentuates some of its all-but-unique attitudes and proclivities. Continue reading in the Wilson Quarterly. 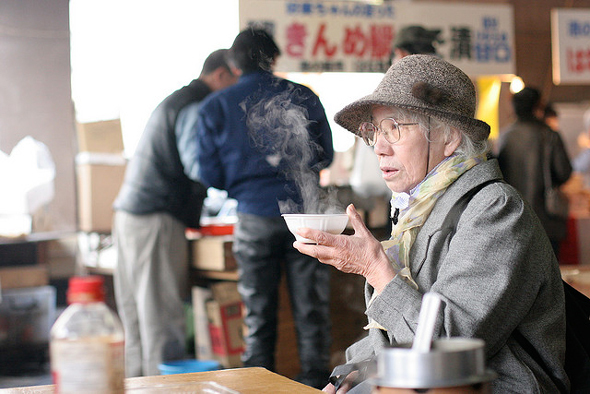 Photo Credit: Japanese woman enjoying some free soup for breakfast, courtesy of flickr user USAFA87.